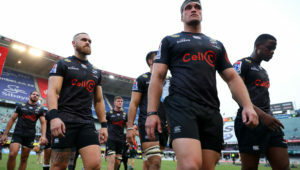 The Sharks have a number of seniors on duty with the Springboks or in Japan but were able to put in a workmanlike performance to beat Bordeaux 19-17 in difficult conditions at the Moses Mabhida Stadium on Friday. 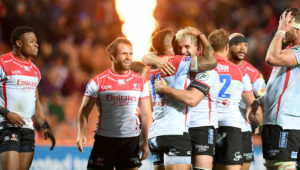 The match concluded the team’s preparations for the Currie Cup as they start their season with a tough match against the Blue Bulls, who beat the Cheetahs 34-12 in Bloemfontein. ‘It was a great occasion to play at Moses Mabhida Stadium, it was just a pity about the weather,’ Du Preez said. ‘To play here was a big occasion for the boys. ‘The first half was really difficult for the French because we had the wind behind us and we knew there would be a big onslaught from them in the second half, but I thought our defence was really outstanding except for those two tries right at the end. Letting in two soft tries was disappointing. One of the outstanding youngsters was speedster Aphelele Fassi, who scored a fantastic 60m counter-attacking try in the first half. ‘He’s a kid with lots of talent and I’m really looking forward to seeing how he goes in the Currie Cup this year,’ said Du Preez about the 20-year-old wing. ‘But singling out individual players isn’t fair, I just thought all the boys who pulled on the jersey for the first time did really well. I was very impressed with the effort out there, we had to control a lot of scraps on the floor and their reactions were really great. 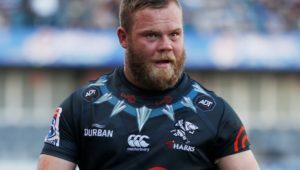 ‘It’s good to have the experience in the team, you always need a nice mix of experience and youth, but you want to bring the youngsters through and I’m really excited about seeing them playing in the Currie Cup, it will be a good platform for them going forward into Super Rugby next year,’ Du Preez added.